Users’ working life constantly moves from desk to laptop to smart phone to tablet. Now they can use all the features of their Hosted PBX solution from almost any device, whether they are at their desk, at home or on the move. Our Accession Mobile application keeps users connected wherever they are. It’s a fully featured soft phone which enables them to send and receive calls, instant messages or video calls from any Internet connected device. This enables partners to generate increased revenue, and also ensures they have a solution to cover all their customer requirements. The Application gives you the ability to message and chat fellow workers with an easy to use, and intuitive customer interface. Powerful Presence capabilities allow users to see when their colleagues are available, offline, on the phone or in a meeting. 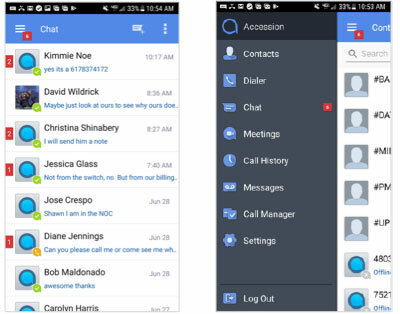 Accession Mobile integrates with Outlook so that click-to-dial and instant messaging can be integrated easily into email, as well as CRM applications and business productivity tools. Users can seamlessly move calls between devices and benefit from a series of mid-call features, such as transfer, park, hold, etc. The service has an advanced recording capability, so you can remotely record and store calls, and easily access them as required. This feature enables users to make calls from 3G/4G or Wi-Fi connections. Accession Mobile is fully integrated into our advanced IP voice services network and provides reliable performance and great support. The user’s sensitive information is safeguarded with our industry standard security and privacy measures. By enabling team members to work from any location, you support the new method of working and Accession Mobile becomes an important part of their business continuity strategy. Interested in becoming a white-label partner?